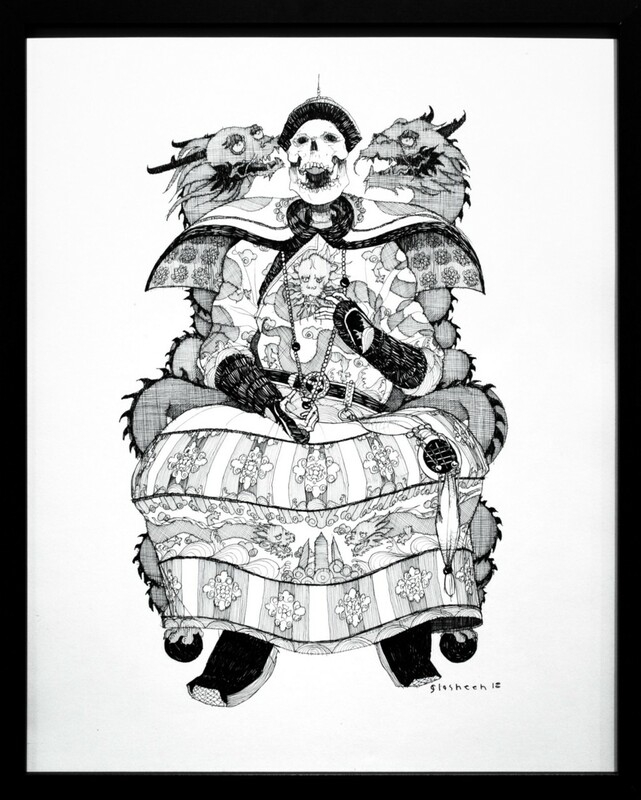 The collection of ink illustrations draws parallels between historical rulers and today’s political climate. Derived from annals of dynasties across the world, depictions of crowned heads have conquered Paradigm Gallery and Studio. Though portraying sovereigns of 10th century Ireland to fifth-century Mandé, these illustrated regal thrones are actually ruled by corpses. As Passyunk Square artist Kate Glasheen executed these morbidly royal visions from pen to paper, she noticed her collection of 16 ink-drawn kings mirrored today’s executive state. The unplanned parallel has led to Glasheen’s first solo show, “Dead Kings,” at the Queen Village gallery, which opened Friday, Jan. 25. Riveted by the motifs of indie video games, tarot cards and her brother’s “Dungeon and Dragons” books, Glasheen has always found herself drawn to grim yet fantasy-esque images. 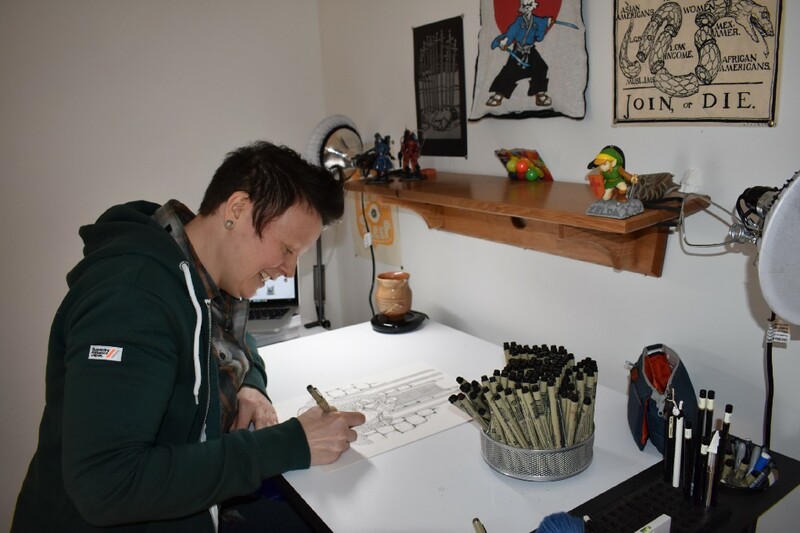 While growing up in Troy, New York during the 1980s and ’90s, Glasheen unraveled an aptitude as she began doodling with micron pens. After high school, Glasheen studied fine art at Pratt Institute’s Utica site in 2000 before transferring to the Brooklyn campus her junior and senior years. Along with work showcased in spaces like LA Gallery’s 1988 and Brooklyn Gristle Gallery, Glasheen found a particular knack for comics, which she has illustrated in both ink and water colors for a several publications. Adding to her accumulation of comic book contributions, including the Adventure Time series, Hybrid Bastards!, The Sakai Project, Resist! and the Graphic Canon series, Glasheen’s “A Radical Shift of Gravity,” a collaboration with Nick Tapalansky, will be released in November by Top Shelf Productions. But, “Dead Kings,” she says, stands out from the rest of her work, evoking influences from her youth and fusing them with both historical and contemporary contexts. In early 2018, as she began researching and doodling bygone potentates, Glasheen says similarities surfaced between the luxuriousness demonstrated by medieval rulers and the gold-plated lifestyle of the United States’ current commander in chief. Even beyond the White House, “Dead Kings” evokes resemblances to other rising autocratic leaders across the world, as Glasheen conveys that such behavior is often repeated through the ages. But, like their predecessors of several centuries ago, when opulence is stripped from these superiors, all they have left is mortality. From researching to sketching, each of the 16 kings, which are drawn on archival paper ranging from 14″ x 11″ to 20” x 16” dimensions, averaged somewhere from 10 to 15 hours to complete. Since February, Glasheen first sketched each king with loose pencil drawings and then later traced over the intricate designs using micron pens. While the pencil acts as a “suggestion,” the ink, she says, is used to make decisions. The very first drawing, which reveals a lifeless skelton slouched against a brick wall, was scrapped. In Glasheen’s eyes, the image included excess scenery, shifting focus away from the kings. So, while each king is posed and placed in slightly different scenarios — some smugly riding horses, others sluggishly sitting on thrones — every image maintains a certain level of negative space. The intentional focus on the kings coincides with the medieval mindset that rulers were once, or perhaps still are, perceived as the center of the universe. But they, too, are not an anomaly to death. Info: “Dead Kings” will run at Paradigm Studio and Gallery through March 16.